Unfortunately, five8ths.com is down for a few days while the domain transfer takes effect. In the meantime, feel free to sign up for seasonal updates and specials by entering your email address in the box below. Thanks for your interest! My grandfather died last week, and I traveled to his Iowa farm, where I got to know him and the family a little bit better. Although I have been there many times and had my share of experiences as the grandchild-farmhand for the day, this trip had more gravity as I traced the family history and connected it to myself. This time as we revisited the buildings on the farm, my Dad told stories about the tools, machines, and the buildings that housed them, all designed and built by my Grandpa. One thing that my Dad emphasized was that he often didn't even draft a plan for the machines (many of them tractors that performed specific, unique functions for the farm) or tools, but had the entire plan in his head. That little piece about the way he worked really stood out to me, because I also work this way, so it seemed like a small part of him that I was lucky enough to inherit. Like him, I have a strong visual image of my designs that I keep in my mind, but (perhaps unlike him) my drawing skills are so poor that my sketches usually fail to capture the image I have in mind, so I often skip the drawing and go straight to drafting and draping the pattern. I sculpt the image that is in my mind, rather than drawing it first. His workshop was especially attractive to me. Each tool in it's place, ready to be used. The time spent with tools, to me, is the best part of creating. This is the time for learning, inventing, perfecting, problem-solving, and finding the most elegant way of fitting pieces together. The product is nice too, but the process of creating is what's important to me. I would be flattering myself to suggest that my skills live up to the skills of my Grandpa, but as I continue to develop as a designer and maker, the way I go about my work will remind me of my Grandpa and my connection to my family. One thing that I'm certain I inherited is the open-hearted love passed between family members, and for that I have so much gratitude. And one more thing to admire---for work and for dress, he always had great personal style. Here's a peak at a few of the fabrics that will be in the fall/winter line, which I'm currently designing. Fall is the season I most look forward to each year, and I have been planning this line enthusiastically. I'm even hoping to expand a bit beyond shirts. The line will debut and be available soon! One of my good friends lives in Brooklyn, so we had a chance to hang out quite a bit during RCF. He is one of the only people in the world who will talk with me about the fashion details in a men's shirt for hours on end! He has a unique personal style, which I am often inspired by when designing. He really liked the original Pencil Shirt fabric, but had the idea that it would be a great addition to his wardrobe as a short-sleeved shirt. He also is one of the few people alive today who really loves long shirt-tails, and always tucks his shirt in! The result was a simple short-sleeved shirt with one pocket. I have enough fabric to make one more, so let me know if you are interested! At the Renegade craft fair last month, I had the pleasure of meeting a man who said he had retired so didn't need to wear a shirt to work anymore, but he "just loves shirts". His wife said he "needed a shirt like a hole in the head", but he was enamored with the Keyboard shirt, and raved about Ben's Wagon shirt and its banded collar. He suggested the idea of ordering the Keyboard shirt with a banded collar, and so to visualize how this might look, I hid the collar inside the shirt and realized that his idea was actually a more striking design than the original! I'm really happy with the results, and hope he enjoys wearing it as much as I enjoyed making it. Thank you to everyone who stopped by my booth at Renegade craft fair in Brooklyn this weekend! It was really valuable and affirming to get feedback from so many different types of people, and it has given me guidance with how to move five8ths forward. I'm sure five8ths will be back in Brooklyn again soon! I am delighted to announce that five8ths was chosen for Brooklyn Magazine's feature on the 10 best booths at the fair! The spring/summer designs that made their debut at the fair are now featured on the five8ths website and available on etsy. I will be introducing four new designs (in addition to the Lawn Shirt and even some Shackets) this weekend at Renegade craft fair! If you can't make it to the fair, they will be available online starting next week. Brooklyn Renegade craft fair is next weekend! I will be there with 25 shirts---five different sizes of five different designs, and with extra fabric available for orders. I'm sharing a booth with Nikkuu design (Melissa Moore, also from Baltimore), in space 145 (see map below). I hope to see some familiar faces and meet new friends as well! This fine cotton shirting fabric is composed of horizontal stripes in a kaleidoscope of colors up-close, but only a few feet away, the tawny base color dominates and creates a neutral tone, broken up by a horizontal, textured, faintly-green stripe. High thread-count, 100% cotton shirting. Available at Brooklyn Renegade craft fair in sizes 38, 40, 42, 44, and 46, in addition to custom-sized orders. Available at Brooklyn Renegade craft fair, June 23-24. Short-sleeved, one pocket. 100% cotton. Sizes 38, 40, 42, 44, and 46 (one of each). Four available for order following the craft fair. I have been in production mode for the past few weeks, getting ready for Renegade craft fair in Brooklyn next month. This week I am finishing up five linen dress shirts (more info on those soon). 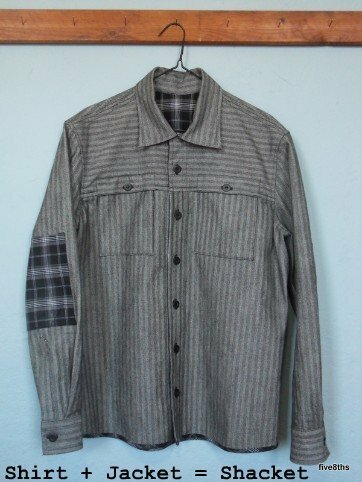 Production mode is quite different from design mode, in that I do each process involved in building a shirt five times in a row (make five collars, make ten sleeve plackets, etc.). Today I concentrated on some of the benefits of repetition, such as the process of perfecting skills. It's amazing to me that, with barely any conscious action, once I get to the fifth shirt, the results are not only better, but faster than the first shirt! Repetition, such a huge part of our everyday lives, can also be comforting and confidence-building. So, I was taking a meditative approach to the work all day. Then, half-way through the day, my meditative reflection on repetition was interrupted by a reminder of the big picture of the work that I'm doing. I received a package from another independent designer, Fischer, containing a shirt I'd ordered! I savored the experience of opening the beautiful packaging and getting to know my new shirt! A personal note and surprise gift were included as well, which made it even more special. I know this piece of clothing will be in my life for a long time, and a regular part of my week. While immersed in the construction details of each cut piece of fabric, I had temporarily forgotten that the work I am doing is part of a larger movement of locally designed and made clothing, and remembering that allowed me to appreciate each part of the process even more. The list of artists that will be at the Brooklyn Renegade craft fair this summer has just been posted! I am happy to announce that five8ths is included!! The artists are listed in alphabetical order, or you can find me by looking for the detail image of the Lawn shirt from this season. I've just spent a good chunk of time visiting the websites of some of the other artists on the list, and I couldn't ask for better neighbors at the fair! Stay tuned for more info on the styles that will be available at the fair! 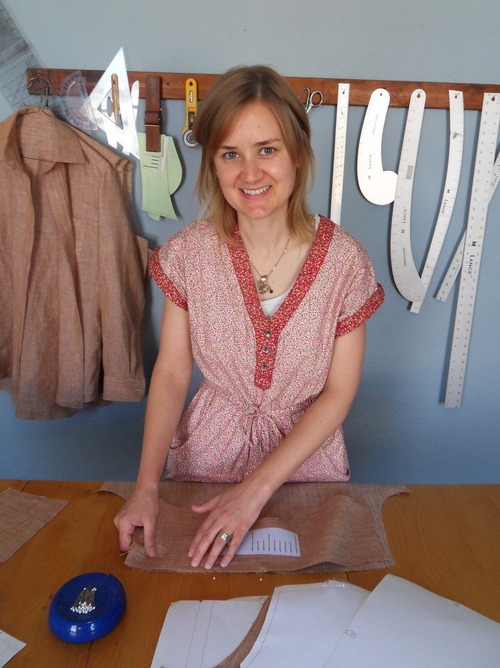 This week, I have been sewing a muslin version of each of the custom slopers that I drafted last week. Drafting and sewing five different custom slopers at a time has emphasized the many differences in body shapes that aren't accommodated for in standard sizing. These variations in shape are unique enough that when I hold up a finished pattern or muslin, it's like looking at a puzzle piece that will fit only in one space, and I am able to visualize the person for whom the muslin was drafted. Even though the outline of a men's shirt is generally rectangular, the subtle variation in cut built specifically for each customer is visible. I have been drafting custom patterns all week to fulfill orders from my new spring/summer line. Thank you to everyone who placed an order! For my whole adult life, I have been self-conscious about my tendency to be a bit OCD. I always worry that I will annoy people by being so thorough, so fastidious, so knit-picky, etc. I'm always apologizing for these behaviors, both verbally and with my body language. Recently, I've experienced the benefits of being so particular, so attentive to detail-----it means that I do a good job on a number of things (where this would be important)! That high standard for the quality of every detail of what I'm working on has been noticed both in my Montessori activities and my work in fashion. It really boosted my confidence to, for the first time, acknowledge that something I've always considered a failing might actually be an asset (while still underscoring that it can also be a hinderence in certain ways and activities). The men's spring/summer line is available now! I was in NYC in early February to attend an expo of fabric and notions suppliers. I spent many hours paging through fabric swatch cards from many different companies. There were a few companies offering organic and recycled fabric, and even a tiny amount of hemp and bamboo, which was pleasantly surprising. I am a thorough decision-maker, so my initial round of selections were plentiful. Most of the swatches have arrived now, so I am starting to think about fall designs and new additions to my line. All of the fabrics are beautiful, and seeing them again in my own studio has already clarified some things and reduced some of the agonized decision-making that will take place over the next few weeks. On a related note, while at the expo, I came into contact with many people who plan to operate their small fashion businesses following the larger-scale, fast-fashion model of breaking down each stage of the process of designing and producing clothing into separate jobs handled by many different people. More copies of a particular line or design are able to be produced in a smaller amount of time with this method---this reduces the amount of profit needed to be made on each garment, reducing the price. This has become the norm, and the expected. Distilling the work of designing and making clothing into distinct processes, and then being involved in only a portion of those processes, is a very different activity from the "slow design" that I practice. Sharing an atmosphere with the people and industry practicing fast fashion further solidified my grounding in the hand designed and drafted, handmade, custom-fit, limited-edition, thoughtfully designed world in which I'm operating now as five8ths. The ground seems firmer and stronger here. Check out this article, "It aint just pickles", from the NYT. I would lump artisanal clothing in with the artisanal food and other products mentioned in the article; the expertise gained over a period of time specializing in this work renders beautiful, well-fitting, well-loved clothing. "It’s tempting to look at craft businesses as simply a rejection of modern industrial capitalism. But the craft approach is actually something new — a happy refinement of the excesses of our industrial era plus a return to the vision laid out by capitalism’s godfather, Adam Smith. One of his central insights in “The Wealth of Nations” is the importance of specialization. 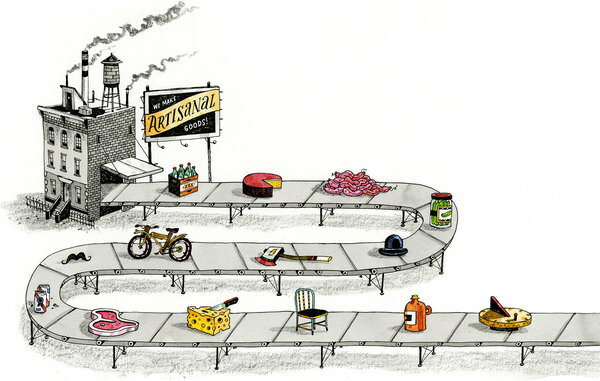 When everyone does everything — sews their own clothes, harvests their own crops, bakes their own bread — each act becomes inefficient, because generalists are rarely as quick or able as specialists. "For most of human history, though, people needed to do a bit of everything to survive. The result was a profoundly inefficient economy that required almost everyone to work very hard just to create enough of the essentials for survival; even then, famines were still disturbingly common. Efficiency, Smith explained, comes when individuals focus on specific tasks. The miracle of the Industrial Revolution was that through specialization, humankind became far more productive."